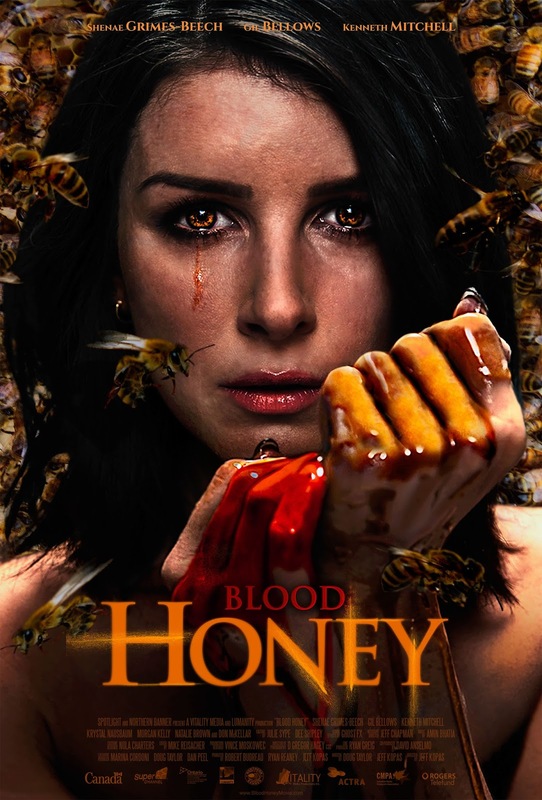 Win a run-of-engagement pass to see Blood Honey in Toronto, Vancouver or Calgary, courtesy of Northern Banner Releasing! Blood Honey is playing exclusively at Cineplex Yonge-Dundas in Toronto from September 1st to 7th, and is playing for one day only at Cineplex The Park Theatre in Vancouver on September 8th and for one day only at Cineplex Odeon Eau Claire Cinemas in Calgary on September 12th. Via Facebook: LIKE & FOLLOW our Facebook page and leave a COMMENT on it to answer the following trivia question: What is the name of Blood Honey star Shenae Grimes-Beech's character from her years on Degrassi: The Next Generation? Also, don't forget to tell us which city you are entering for! Click here to enter. Via Email: EMAIL thereelroundup@gmail.com using the subject line 'Enter Me to Win ROE Passes to see Blood Honey', and provide your full name and email address in the body of the email, as well as the city you are entering for. Contest open to legal residents of Canada aged 18 years or older at the time of entry, and closes Tuesday, August 29, 2017 at 11:59 PM Eastern Time for Toronto entrants, Tuesday, September 5, 2017 at 11:59 PM Eastern Time for Vancouver entrants, and Friday, September 8, 2017 at 11:59 PM Eastern Time for Calgary entrants. One prize per household. Odds of winning are dependent on the total number of entries received. Winner(s) will be selected at random, and will be contacted via Twitter direct message, Facebook message or email, depending on the method(s) of entry. Should a winner be disqualified or fail to respond in a timely manner in cases where further information is required from him/her to redeem the prize, The Reel Roundup™ reserves the right to draw another winner in his/her place. By participating in this contest, all entrants agree to be bound by these rules and regulations. The Reel Roundup™ accepts no legal liability in relation to the operation of this contest.